Sammy (age 5) rates this “5 spoons” and “3 thumbs up”! I added a little quinoa to the chili to make it even more nutritious. My kids think of quinoa as “rice”…whatever works right?! Another tip I learned from Connie…Be sure to “fry” your sauce before adding in the liquids. 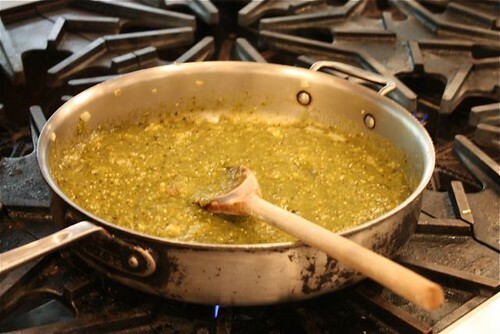 What that means is cooking down the roasted pepper and tomatillo puree in a little olive oil along with the onions and garlic until it “pulls away from the pan”…doing this enhances the flavor by concentrating and thickening up the sauce a bit. 1. Preheat oven or toaster oven to 400°F. 2. Place tomatillos and poblano chiles on sheet pan. Roast in oven until peppers have blistered and tomatillos are soft. Remove from oven. Place tomatillos in blender. Once poblanos are cool enough to handle, remove seeds and skins. Add to blender, blend until smooth. 3. Heat olive oil in a sauté pan. Add onions, cook until caramelized, approximately 5 minutes. Add garlic and oregano, cook until aromatic. 4. Add tomatillo mixture, cook for 10 minutes until slightly thickened. 5. Add stock, beans and their liquid. Bring to simmer, cook for 20 minutes. 6. Add cilantro, chicken and chard. Bring to a simmer, cook for 10 minutes. Adjust seasoning with salt and pepper. What a great atke on chili. I liked that your kids thought quinoa was rice. I really love the addition of quinoa here – in fact, that caught my eye in the picture and made me open the post 🙂 I think it should be in the title of the recipe! The whole thing sounds wonderful. This looks and sounds delicious. I love cannellini beans and there are lots of great flavors going on here with them! Thanks! This is a beautiful Napa style chili. Very nice. This is my first time to your blog. I really like it. Looks like a fabulous dish Aggie! I love the rating system. I wonder how that would work with teenagers 🙂 I’ve never had chard or tomatillos before. I wonder if I would like it. You might have to walk me through this recipe Aggie but I do really want to try it. 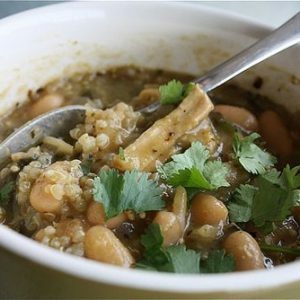 Love the quinoa addition, this looks great!! It looks like it could be really filling and suitable for lazy cooks like myself who like to make big pots of food that can be frozen and used later. Wow, this looks really delicious! Thanks for sharing this recipe, I would sure love to try it! This chili looks and sounds wonderful. I think your addition to add extra nutrition is very clever indeed! I’m printing this up to try vey soon. p.s. I love your blog! This looks awesome!! 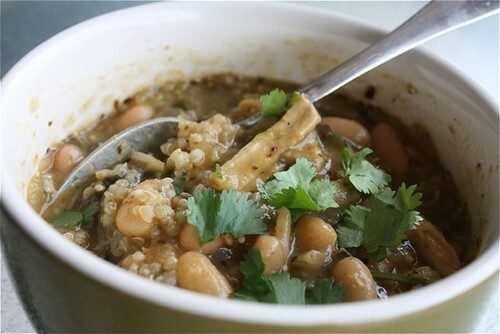 I’m always looking for more ways to use my quinoa, too – thanks so much! Glorious chili! I actually, just added that to my recipes folder and put the necessary ingredients on the shopping list. It was so tasty, wasn’t it? That healthy dish must be very tasty! A wonderful recipe! This looks absolutely delicious. I love the chile in the pesto, what a great addition. I love everything about this recipe. mmmmm looks and sounds wonderful! THANKS for posting this! YEAH! Oh this looks amazing! I love the sonoma pesto- it looks great and I’ll have to give it a try for sure! Keep up the awesome work Aggie! 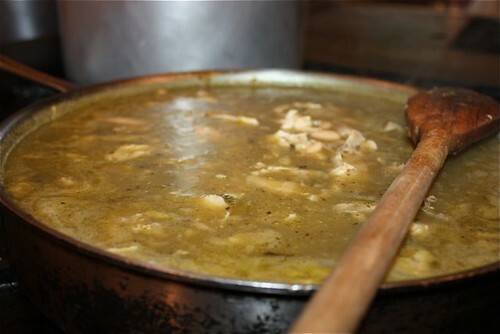 Your chicken chili verde looks tasty. Instead we used pork, as done in many recipes and didn’t use any beans or other spices. Ours chili verde is described at http://desigrub.com/2010/07/chipotle-chili-verde/ . Would love to hear your comments.